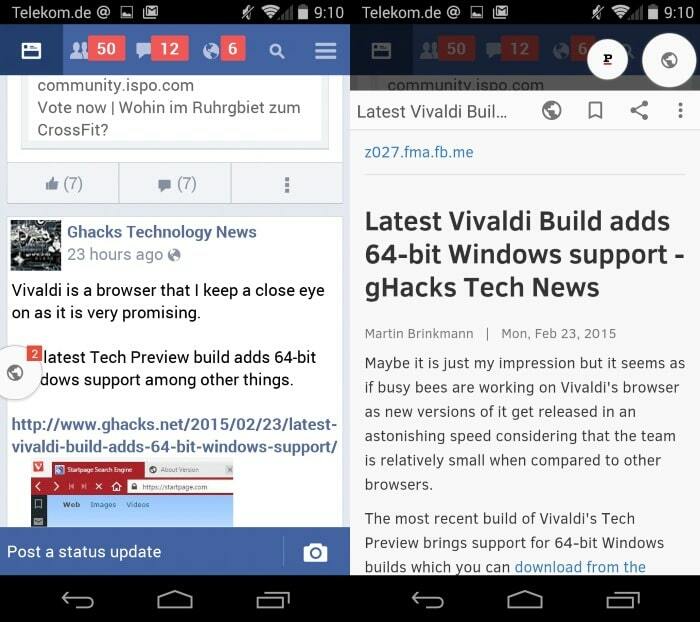 Juggling around between multiple open applications is often not very comfortable on smartphones. Say a link is posted on your wall on Facebook. A click opens it in the default viewer application for links, you read the article and then go back to Facebook to continue whatever you were doing so. Flynx promises to have the solution for this that streamlines the process. The main idea behind the free application is to collect links in the background, load and collect them there until you activate the collection and browse it without leaving the app you are using. The first time you click on a link you need to associate Flynx with links to automate the collecting. While you can also pick it manually each time, it is not a comfortable thing to do especially if you load links regularly on your device. The first click on a link displays a small bubble on the screen in an overlay indicating that it has been added to the queue and is currently loaded. You can add as many links as you want to Flynx from a single or multiple applications. The collecting worked fine in most applications that we tried the feature on including Facebook Lite, Twitter, WhatsApp and Gmail. It did not work in web browsers as they are designed to handle all links and in apps like eBay that use only internal links. A tap on the bubble opens the last link that you added to the queue first. Flynx attempts to display an optimized version of a page when possible. Advertisement and other secondary items such as a sidebar or navigational elements are not displayed in the optimized version. This worked well on blogs but not on other types of contents, for instance forum posts. A toolbar at the top enables you to switch between the optimized version and regular version of a page. There you also find sharing options, an option to save the page to read it at a later point in time, and to access the options of the application. All saved articles and pages are stored by Flynx and displayed to you when you open the application directly on your Android device. There you also find a history listing previously opened web pages. While it is not possible to clean the history automatically, you can remove its contents from the settings manually. Flynx is an interesting application that should prove useful to Android users who open links regularly on their device that are posted in social media or messaging applications. Nice app, installing right now. Seems to perform better than Linkbubble. Will keep it. Thanks for the tip. The former looks like a complete ripoff of the latter, albeit free one. Link Bubble is just as good, but you need to pay for it. I’ve used both. And I like Flynx for the fact that it (free) can support 4 tabs. Also it seems to load and perform better. Flynx also have the option to load a Reading Mode version of the site, which can be helpful! Been using it for some time now- useful!